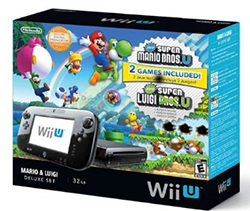 Enter to win a Wii U from Just Free Stuff! They just started their May Giveaway. Simply click on the picture below and enter in your email address and at the end of the month one lucky winner will win a Wii U Deluxe Set which includes the new Super Mario Bros U and Super Luigi U! This looks like so much fun. The whole family would love playing the wii u! !